Aug. 11, 2009 -- The Boeing Company received a $500,000 contract from the U.S. Marine Corps Warfighting Laboratory on Aug. 5 to demonstrate the company's A160T (YMQ-18A) Hummingbird for the Marines' Immediate Cargo Unmanned Aerial System Demonstration Program. "This is a big win for the program and Boeing's newly created Unmanned Airborne Systems division," said John Groenenboom, A160T program manager for Boeing. "Since 2007, when the A160T made its first flight, it has shown it has the ability to carry multiple payloads and perform at various altitudes and speeds. We are confident it will perform well for the Marines." In flights that will take place by February, Boeing will demonstrate that the A160T can deliver at least 2,500 pounds of cargo from one simulated forward-operating base to another in fewer than six hours per day for three consecutive days. The Marines are studying the use of unmanned aerial vehicles in lieu of trucks and personnel to deliver supplies. "This is an important mission, and we are very pleased to have the opportunity to demonstrate the A160T's capabilities for the Marine Corps," said Vic Sweberg, Boeing director of Unmanned Airborne Systems (UAS). "By creating a new division specifically for unmanned airborne systems, Boeing can better support our customers' growing requirements for unmanned capabilities, and the A160T is among the most versatile platforms of our UAS business." 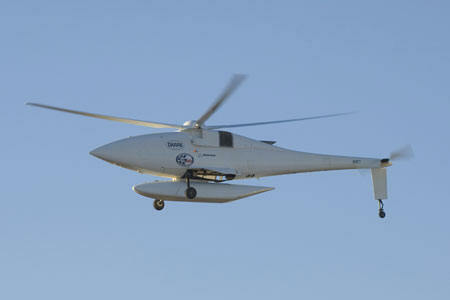 In addition to the A160T Hummingbird, Boeing's UAS division includes ScanEagle, SolarEagle, and MQ-X. The A160T has a 2,500-pound payload capacity. It features a unique optimum-speed-rotor technology that significantly improves overall performance efficiency by adjusting the rotor's speed at different altitudes, gross weights and cruise speeds. The autonomous unmanned aircraft, measuring 35 feet long with a 36-foot rotor diameter, has hovered at 20,000 feet and cruised at more than 140 knots. The A160T established a world endurance record in its class in 2008 with an 18.7-hour unrefueled flight.